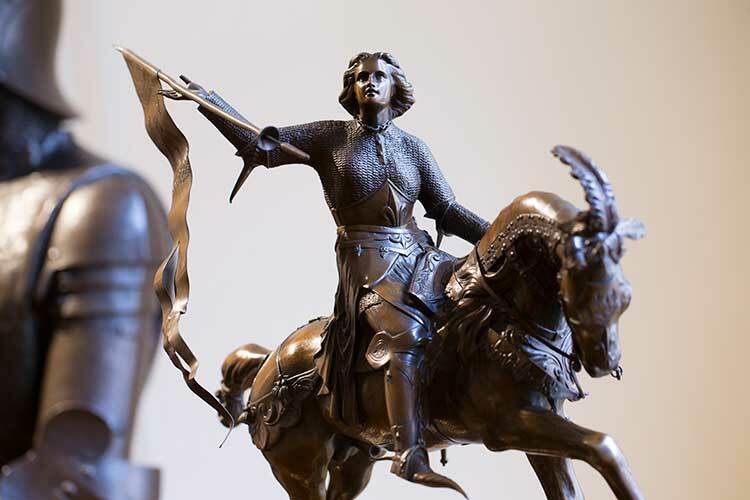 The Joan of Arc Museum in Vaucouleurs is devoted to illustrations of this tragically-destined figure who has inspired writers, artists and historians since the Middle Ages. 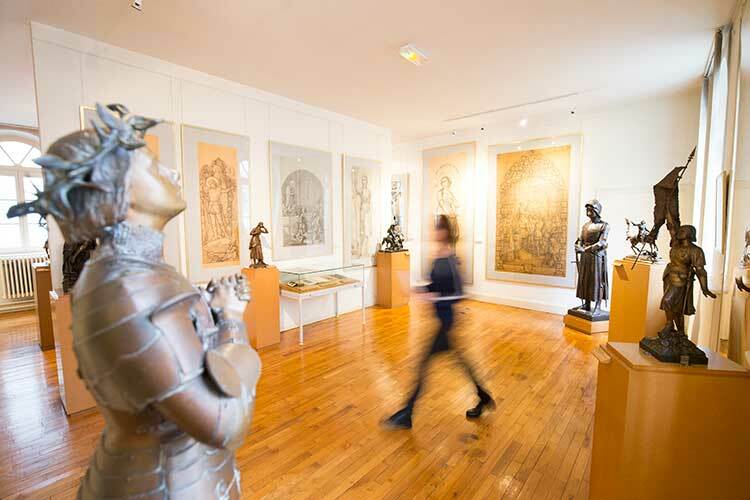 Through a wealth of drawings, stamps, fresco cartoons, bronze sculptures and signs, the four sections of the Vaucouleurs museum reveal the various symbols linked to the image of Joan of Arc, simultaneously a virgin, a warrior and a martyr. The Salon des Mariages at the town hall has preserved the painting done by Jean-Jacques Scherrer in 1886, depicting Joan of Arc leaving Vaucouleurs. It can be viewed on a guided tour. 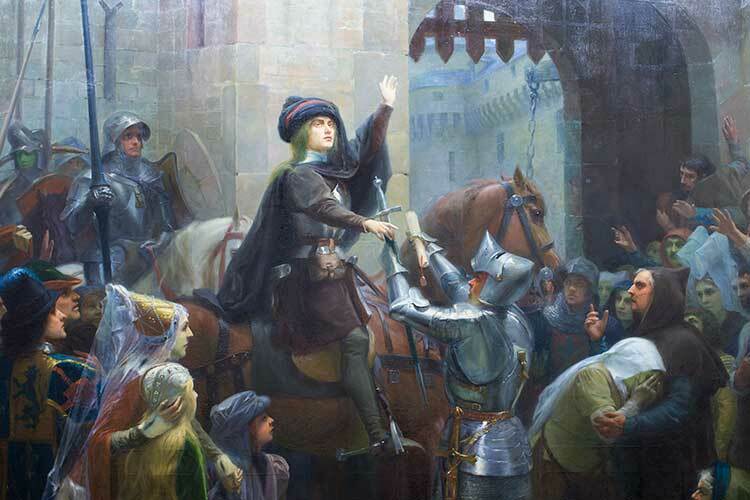 The town of Vaucouleurs played a major role in the saga of Joan of Arc. 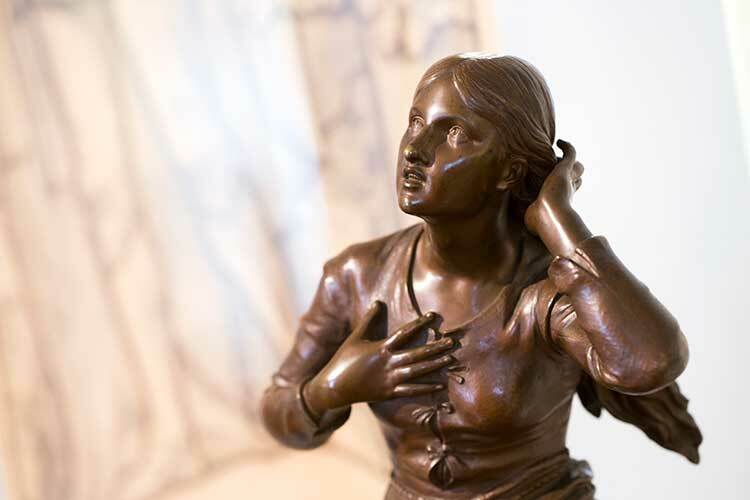 Perched high up above the town is the evidence for this: the remains of the chateau, the Porte de France, and the crypt where Joan prayed before the statue of Our Lady of the Vaults, not forgetting the lime tree at the foot of which the girl is said to have rested. 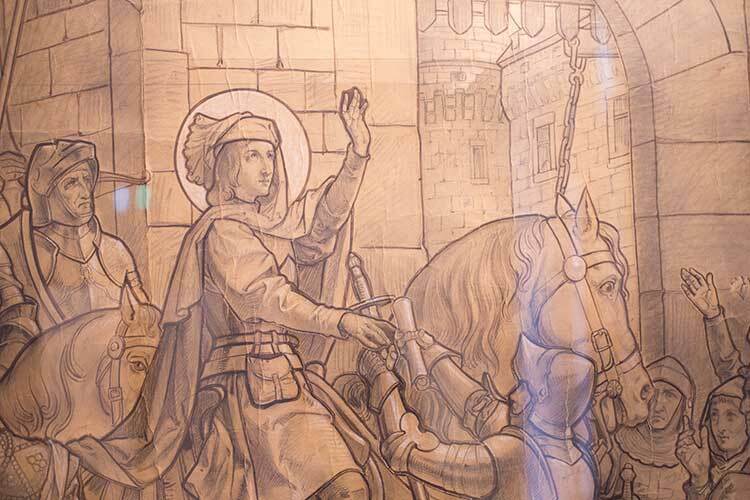 The chapel has preserved 26 stained glass windows made by the Nancy-based workshop of Höner, Benoît and Janin, which tell the entire story of Joan of Arc. 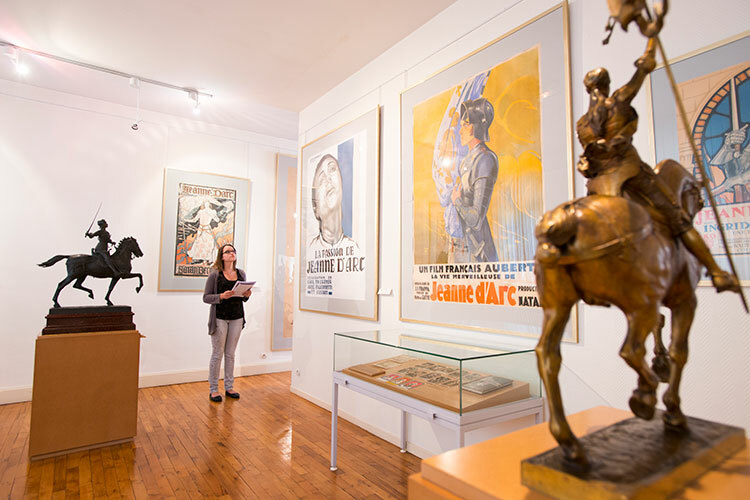 Vaucouleurs’ Joan of Arc Museum owns the majority of the cartoons for these windows. The museum and historical sites are open to the public by request. You can arrange a tour at the Canton de Vaucouleurs Tourist Office. From Monday to Friday, between 9.30am and 12 noon, and from 2pm to 6pm. From 10am to 12 noon and from 2.00pm to 6pm, Monday to Saturday. From Monday to Friday, between 9.30am and 12 noon, and from 1.30pm to 6pm. 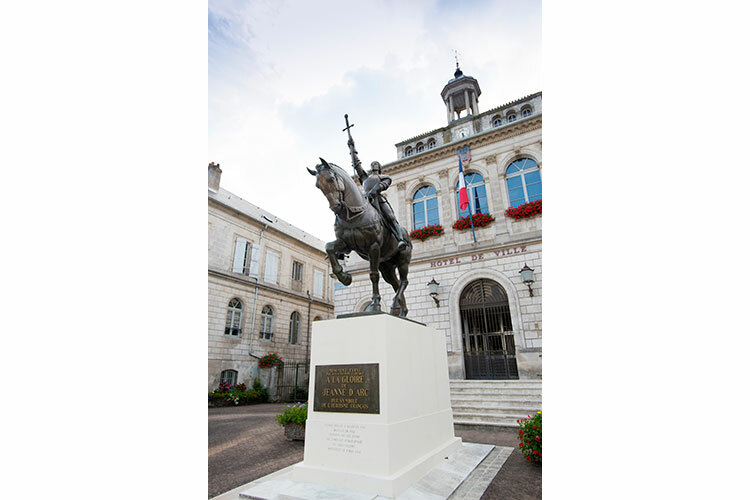 The Joan of Arc Museum is involved in events organised by the Ministry of Culture, such as Museums Night, and the European Heritage Days. The rest of the year features a range of shows, concerts and conferences. Check out the programme! Children can learn about the museum with Camille and Clément, characters in the kids’ guide booklet. 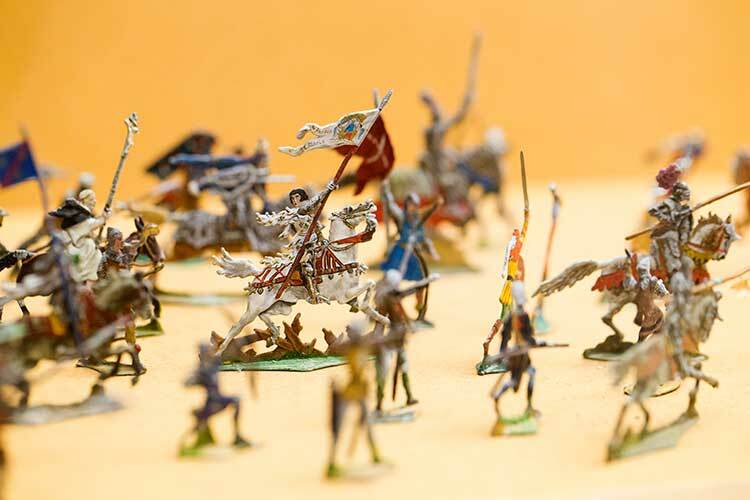 Various workshops are organised during the school holidays for children aged 7 to 12 years, including introductions to stained glass windows and illuminations, learning about weapons, helmets and games from the Middle Ages, and unlocking the mysteries behind coats of arms. €5. Check out the programme! To celebrate its anniversary in unique style, the museum is offering a package consisting of two workshops of your choice and a birthday tea. €15 per child, maximum 12 children.